In early Aug. 2018, Hebei Province published an air pollution control plan for the autumn and winter of 2018 and specified the arrangements and requirements for heavy-polluting enterprises in the Beijing-Tianjin-Hebei Region. In late April 2018, Zhejiang Juhua published Q1 financial report, unveiling a YoY increase of 132.12% in net profit. Fluorine industry has been one of the fastest developing and most promising chemical industries in China. And the country has become one of the largest fluorine production and consumption areas. Inorganic fluoride, fluor-refrigerant, fluor polymer and fluor-intermediate are four important sectors of China's fluorine chemical industry. At present, domestic inorganic fluoride industry is developing rapidly, and domestic high-end techniques for inorganic fluoride production are close to the international advanced level. However, many domestic manufacturers still produce low-end inorganic fluoride products. And some of the refined products, such as electronic grade fluoride, still rely on import. Fluorohydrocarbon is used in various industries such as refrigerant, foam beater, extinguishant, insecticide, medical and chemical. Among them, the refrigerant industry shares the largest consumption of fluorohydrocarbon. Refrigerants are mainly used in household refrigerators, automobiles, marine and household air conditioners, commercial refrigeration equipment, etc., and they not only can be used in producing new equipment, but also in maintenance. Currently, the replacement progress of refrigerants is being constantly accelerated in China. Fluor resin is widely used in coatings, sealing, architecture, electronic and other fields. China is a major producer of fluor resin, but yet to be self-sufficient in high-end fluor resin products. At present, difference between import price and export price of fluor resin is still large and domestic enterprises need to work hard to develop advanced technology and high-end products. It is expected that domestic fluorine resin manufacturers will focus on developing PVDF, FEP, high-end and modified PTFE, and other fluorine-containing resins. The applications of fluor rubber include automobile, petrochemical, aerospace, electric appliance, machine manufacture and light industry. Development of the fluor rubber industry in China has been restrained by lack of varieties and backward processing technology. It is expected that domestic fluor rubber manufacturers will pay more attention to the production of high-quality fluor rubber. This report is a value analysis of the fluorine Industry in China, which covers the production, price, imports & exports, consumption of fluorite, refrigerant, inorganic fluorides and fluor polymer products. Besides, a future forecast on the development trend for these products will be analysed in this report. This report is based on data collected via diverse sources. The primary sources include interviews with industrial experts, key players in fluorine Industry production. Various secondary sources include published magazines, journals, government statistics and CCM’s database, etc. Data obtained from various sources have been combined and cross-checked to ensure that this report is as accurate and methodologically sound as possible. Scope of the report Region scope: China. Time scope: 2011 to 2017 On the basis of type: Inorganic Fluoride, fluorohydrocarbon, fluor polymer On the basis of raw material: Fluorite To enquire about this report, please email econtact@cnchemicals.com or call +86-20-37616606. 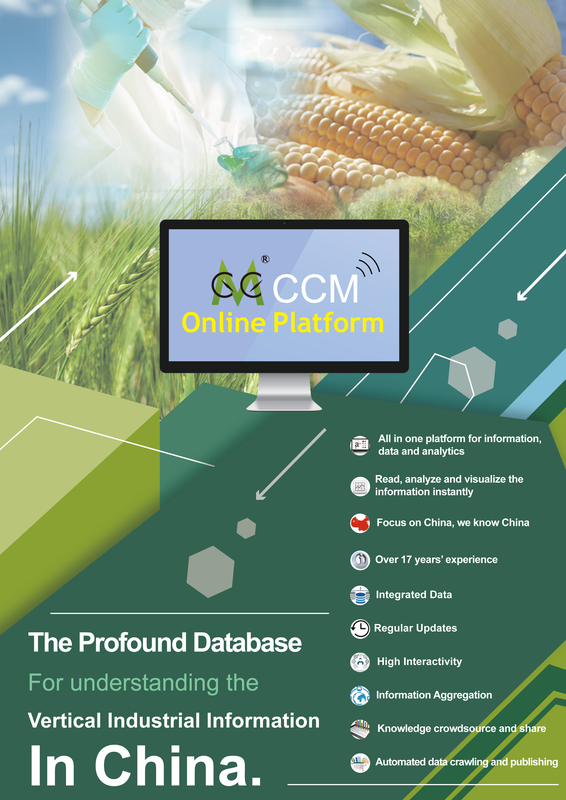 CCM has been providing global companies with strategic intelligence on the petrochemicals market in China and Asia-Pacific for fifteen years, and we publish our research in a range of different formats to suit your needs and budget. Market Data provides the latest data and forecasts on the production, consumption and prices of dozens of different petrochemicals in China.